Identification: A large rat-like rodent which is brown in color with a white muzzle and chin. The outer fur is dark brown and coarse while the underfur is softer and gray. While males are usually bigger than females, the average size of the head and body is 521mm while the average length of the tail is an additional 375mm. It has large, orange, protruding incisors. The hind feet are webbed and the tail is long, rounded and scaly with little hair. It is also similar in appearance to the beaver and the muskrat, although the tails of each are different. Current Distribution: South America, Europe, Asia, North America (Atlantic and Pacific coasts, and from Texas and the Gulf States north through Maryland) in aquatic and marshland communities. Reason(s) Why it has Become Established: Reproduction in this species is very high. Breeding occurs throughout the year, and sexual maturity may be reached in as little as four to eight months of age. Gestation lasts just over four months, and the litter size can range from one to eleven although the typical litter is four to six. Females typically have two to three litters per year. Although the species prefers fresh water and lowland areas, there exist populations in salt and brackish water and in higher elevations. All populations of this species, however, are found in habitats close to wetlands - swamps, marshes, rivers and lakes, particularly those with vegetation along the banks. Although initially farmed for their fur, the downturn of the fur market and human preference for muskrat fur has resulted in less hunting of this animal. Their primary predators in the wild are alligators, turtles, gars, large snakes, birds of prey, and to a small extent now, humans (for fur or meat). They are nocturnal and thus may not be easily preyed upon by daytime predators. Their lifespan is approximately six years over which time the amount of offspring produced is tremendous. Ecological Role: The nutria is an herbivore, although coastal nutria have been known to consume shellfish as well. They eat primarily aquatic vegetation and can consume up to 25% of their body weight each day. They consume the entirety of a plant including the stems, leaves, roots and bark. As indicated above, the nutria's diet puts it in direct competition with the muskrat and various waterfowl. Predators are also listed above. In limited quantities, nutria would serve a very useful purpose in thinning waterways choked with vegetation. Benefit(s): This animal is valued for its fur and in some places its meat. It is also valuable for its ability to consume vast quantities of aquatic plants - weeds and vegetation - which can reduce the over-vegetation of aquatic areas such as ponds, lakes and marshes. 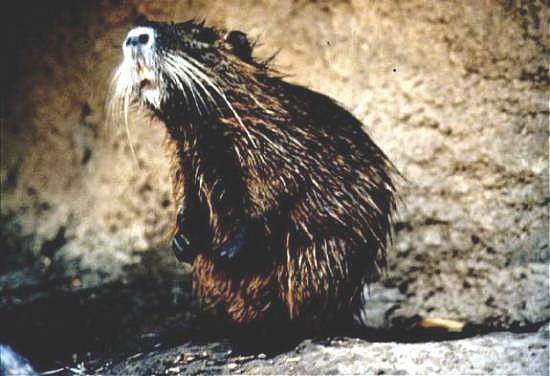 Threat(s): The Nutria is too efficient at eating which is threatening habitats, native plants and other wildlife. Their high reproduction rate and resulting overpopulation is stretching limited trophic resources and threatening other species such as waterfowl (ie. bitterns and marsh harriers) and muskrats. By consuming the young and fragile plants in an area, they are capable of turning marshes into vast stretches of open water. Their burrowing actions damage habitats, dikes and levees. They also cause considerable damage to various crop areas such as soybean plantations, rice plantations, sugar cane fields, and sea oats (which stabilize Mississippi's beach dunes) (GSMFC, 2005). 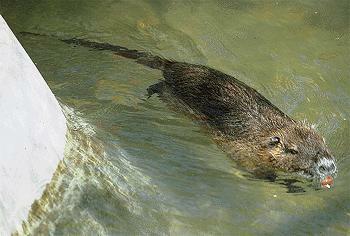 Nutria also carry and can transmit various parasites and diseases. Control Level Diagnosis: Medium Priority. While this species is thought to be declining in South America due to the fur trade (D'Elia, G., 1999), in North America, it seems that this species has gained a significant foothold which is only increasing over time in terms of both overpopulation and damage to wetlands. Several states including Texas, Georgia and Maryland have already begun attempts at decreasing or eradicating this animal. Control Method: Georgia has attempted control of small or medium sized nutria populations through shooting and trapping. (Bertolino, 2005) At least one county in Texas has spent hundreds of dollars trying to eradicate this animal. ( NSRL) Maryland, greatly concerned about the nutria's effects on the marshes on the lower eastern shores, proposed a ten year nutria eradication program. The program was postponed pending the results of a two year study to determine whether "exclusion of nutria from emergent marsh habitats can stabilize or recover marsh vegetation." (Haramis, 1996) It is unclear whether this program was actually instituted. It is also unknown whether the efforts undertaken resulted in the eradication of nutria or reduction in damage to wetlands in specific locales. Bertolino, 2005. "Mycastor coypus" (On-line), Invasive Species Specialist Group database. Accessed November 11, 2005 at http://www.issg.org/database/species/ecology.asp?si=99&fr=1&sts=sss. D'Elia, G. 1999. "Myocastor coypus" (On-line), Animal Diversity Web. Accessed November 11, 2005 at http://animaldiversity.ummz.umich.edu/site/accounts/information/Myocastor_coypus.html. The Georgia Museum of Natural History and Georgia Department of Natural Resources, 2000. "Nutria" (On-line), Georgia Wildlife Web Site. Accessed November 12, 2005 at http://museum.nhm.uga.edu/gawildlife/mammals/rodentia/myocastoridae/mcoypus.html. Gulf States Marine Fisheries Commission (GSMFC), 2005. "Myocastor coypus" (On-line), Gulf States Marine Fisheries Commission Web Site. Accessed November 12, 2005 at http://nis.gsmfc.org/nis_factsheet.php?toc_id=213. Haramis, M., 1996. "The Effect of Nutria (Myocastor coypus) on Marsh Loss in the Lower Eastern Shore of Maryland: an enclosure study" (On-line), United States Geological Survey Web Site. Accessed November 11, 2005 at http://www.pwrc.usgs.gov/resshow/nutria.htm. National Science Research Lab (NSRL) [no specific author or date noted]. "Nutria" (On-line), The Mammals of Texas - Online Edition. Accessed November 11, 2005 at http://www.nsrl.ttu.edu/tmot1/myoccoyp.htm.